We have been using several art books during the past few months to practice our art skills, and make it a routine to do drawings and paintings. We find that this helps us to be more mindful and appreciate nature. Zentagle, botanical natural drawings on the Tangle-Inspired botanicals by Sharla R. Hicks explains how we can mindfully appreciate the unique botanical patterns in nature. The book explains how to setup the workspace, position our body, the vocabulary for different techniques, types of pens and paper to use, and more. The art of tangling, patterning, and marking is explained with images. The repetitive patterns in flowers, making deliberate careful strokes, through counting exercises helps calm the mind and look for creative ways we can make strokes. 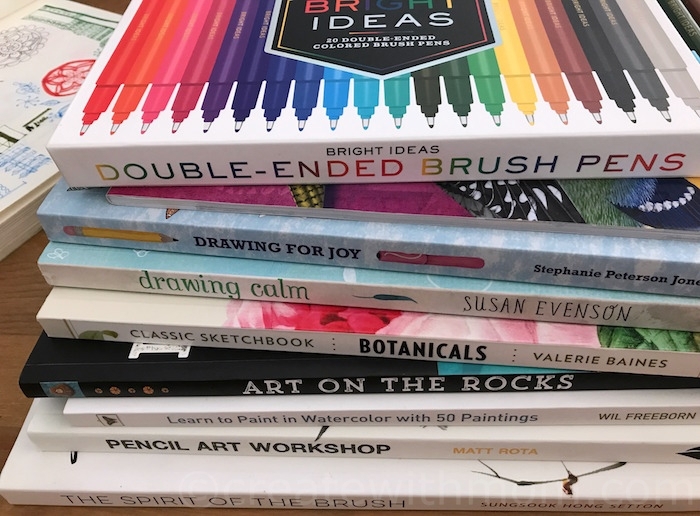 Drawing Calm: Relax, refresh, refocus by Susan Evenson has 20 drawing, painting, and collage workshops for artists of all skill levels to relax and create elegant, "soft" pieces of art that inspire calm and wellbeing. We can use the inspirations from the book and a variety of mediums, including pencil, watercolour, and torn paper collage. How to Draw with a Ballpoint Pen: Sketching Instruction, Creativity Starters, and Fantastic Things to Draw by Gecko Keck teaches us to use a simple ballpoint pen and make steady predictable lines, which are useful for many styles of drawing, including: capturing live scenes of the day, drawing in a sketchbook, or practicing cartooning. How to Draw with a Ballpoint Pen shares a wide variety of topics and techniques including shading, perspective, patchwork, spirals, ornaments, animals, portraits, logos, pictograms, fantasy, abstraction, and more. It is simple to use this book to practice drawing skills, all you need is a pad of paper and a ballpoint pen. Pencil Art Workshop: Techniques, Ideas and Inspiration for Drawing and Designing with Pencil by Matt Rota is a book that teaches how to use the graphite pencil - small, portable, versatile tool available to everyone to create art. Matt Rota demonstrates how to select the right pencil and put it to use in a full spectrum of drawing styles such as fine line work, drawing with tone, quick sketches, photorealism, and pencil combined with paint and ink in mixed media works. With each chapter, he presents an edgy and inspiring international gallery of artists working in that style. 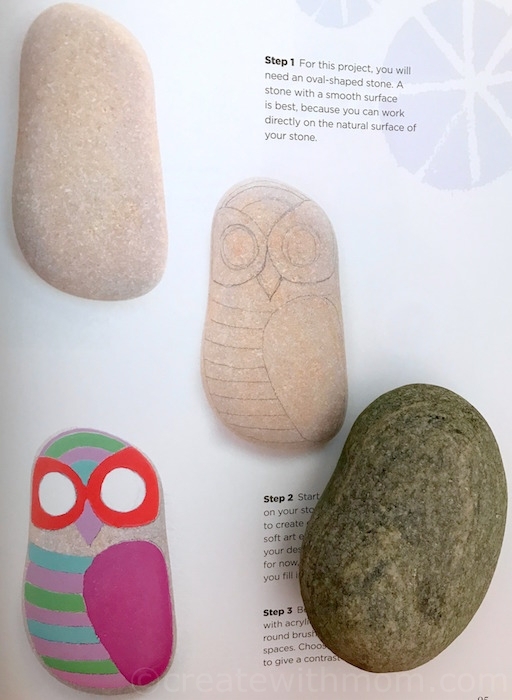 Arts on Rocks is an inspiring book for everyone to start painting rocks. 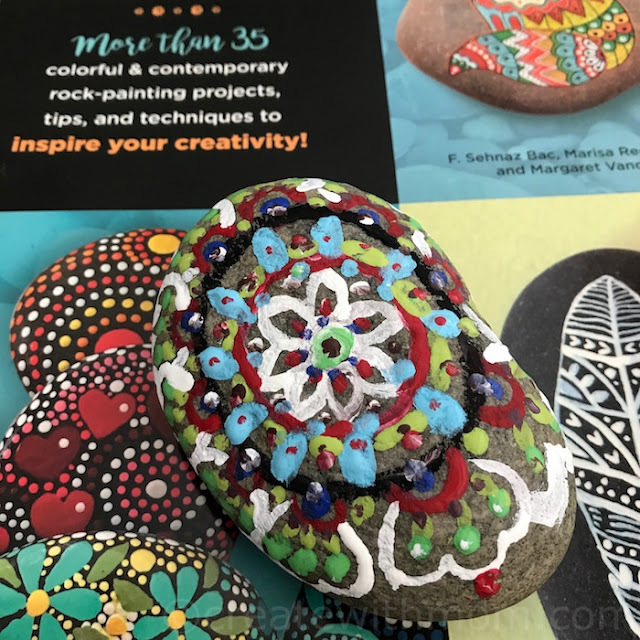 There are more than 35 projects with tips and techniques on this book by authors F. Sehnaz Bac, Marisa Redondo, and Margaret Vance. There are lots of colourful images that will make us want to give this craft a try. We learned about the importance of preparing the stones before painting and varnishing the painted surface. 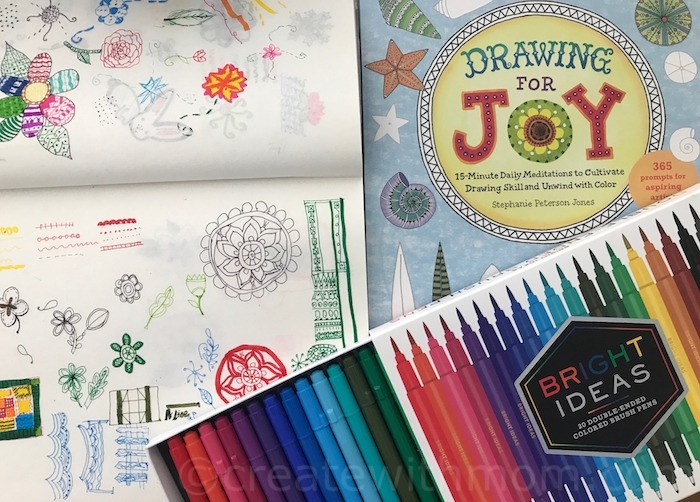 Drawing for Joy: 15-Minute Daily Meditations to Cultivate Drawing Skill and Unwind with Colour by Stephanie Peterson Jones is one of my favourite books. This book is organized by weekly topics and daily prompts for a year. I have been using this book often to learn the basic elements of art, and to do the daily prompts. 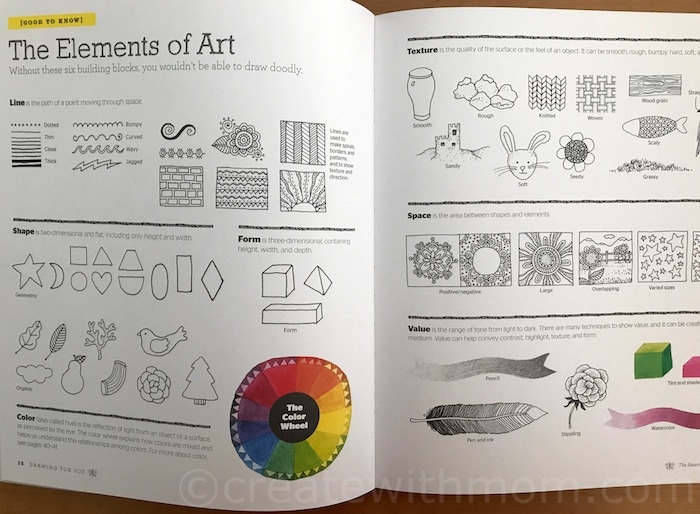 The book explains the types of tools and the elements of art. I found the drawing prompts intended to take about 15 minutes help develop drawing skills. The book starts off with doodles, drawing borders and textures then to draw complex drawing such as motifs using the different elements of art. I think it is better to go through the weekly exercises to benefit from the learning the skills without feeling frustrated. This book helps practice meditative drawing by modifying the exercises as we prefer. The more we draw the less the outcome will matter to us. The author says the process of art will help make the person feel happier, decrease stress level, make everything the person does better, give a sense of joy and peace, become more patient and forgiving, let go of being judgmental, satisfying state of flow and joy. To do this art exercises, I have been using the Bright Ideas double ended coloured brush pens. There are 20 different colours in a package. I like how the brush side of this pen flows to colour in and use it as a paint brush. The other side of the pen is a fine point marker good to do the sketches and to write. These pens will be useful for any craft project. Classic Sketchbook: Botanicals by Valerie Baines reminds us to take a closer look at the details of floral paintings and coaches to try the techniques with the help of an expert's suggestions. It is fun to follow the instructions and try botanical drawings, as the left-hand page features a close-up for a drawing or painting by a noted artist from the 19th century or earlier. The right-hand page is for drawing, with the expert's brief coaching tips, observations, and a demonstrative sketch. The Spirit of the Brush: Chinese Brush Painting Techniques: Simplicity, Spirit, and Personal Journey by Sungsook Hong Setton. The author has learned techniques of Chinese ink painting with Chinese and Korean masters as well as studied Western art in Germany, the United Kingdom, and the United States. She brings excitement to this age old art, as the book shows traditional disciplines for holding and using the brush. Learn to Paint in Watercolor with 50 Paintings: Pick Up the Skills, Put On the Paint, Hang Up Your Art by Wil Freeborn is a detailed book that will teach us how to paint with watercolours. The books has fifty paintings projects, with each of the painting projects we can learn watercolour techniques from using a simple colour wash to learning about ink techniques or letting go with loose, free watercolours. This book is for first-time painters or anyone interested in refining their skills. Easy Bird Origami: 30 Pre-Printed Bird Models by Tammy Yee has many familiar birds of the Western hemisphere such as the Baltimore Oriole, Black-Capped Chickadee, and Northern Cardinal, and birds such as Asia's Strawberry Finch, Africa's Lilac-Breasted Roller, Australia's Red-Backed Kite, and the Flame Bowerbird of New Guinea. Beginning paperfolders will like using the perforated booklet to fold bird models. There are fun facts about each species on the back of each full-color pattern. 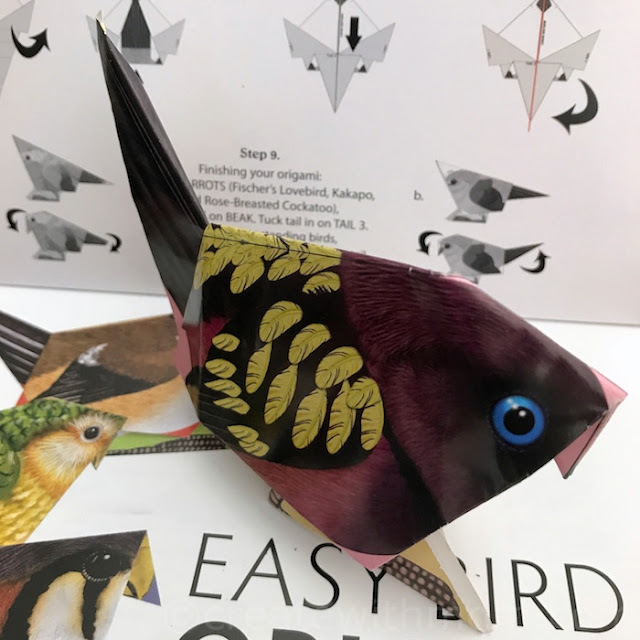 There are printed instructions on the booklet and a link to an instructional YouTube video that makes folding birds easier. 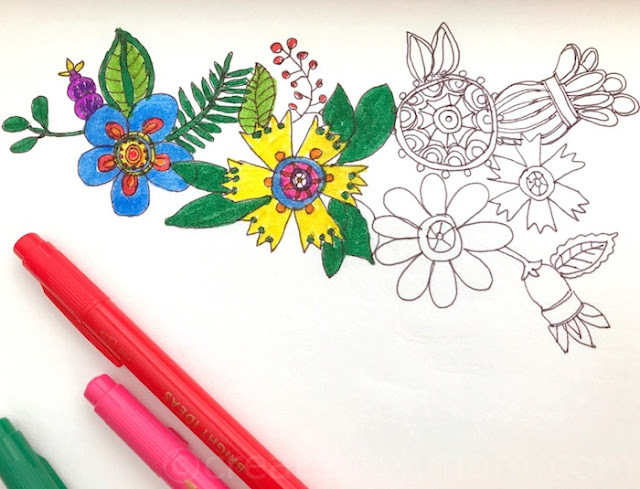 We find taking time during the day to practice any of these different types of art can help with overall self care. All rights reserved on photographs and written content Createwithmom © 2010 - 2017. Please Ask First Disclosure: For reviews and/or sponsored posts on this site I may have received special perks as part of my affiliation. Please note that all opinions and thoughts expressed our my own.